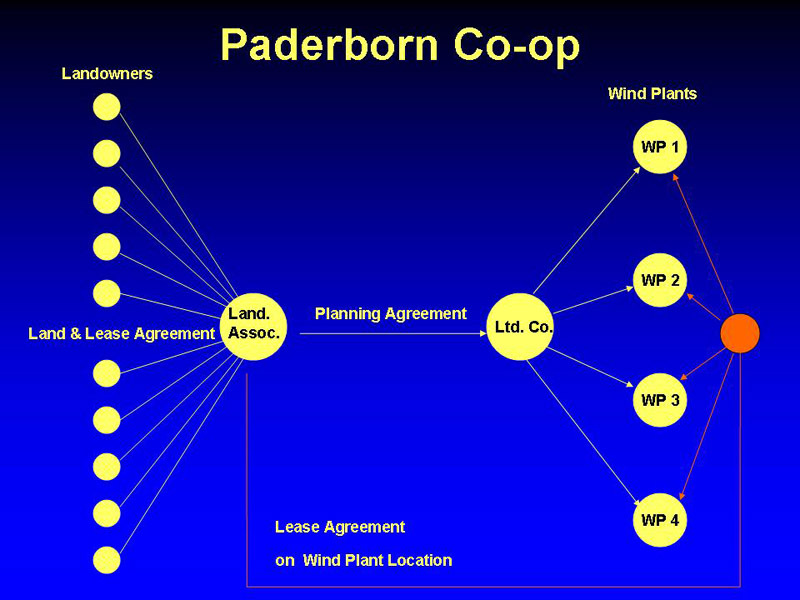 Often in North America wind project developers lease land from individual landowners. Developers lease land to install their wind turbines or ancillary structures such as roads, transformers, substations, and power lines. Unfortunately, landowners often only receive rents or royalties when these structures are placed on their land. Neighboring landowners without wind turbines or the ancillary structures sometimes receive little or nothing. Though some leases include clauses for sharing of revenue on land without wind turbines or other facilities, the fear of no payment whatsoever has led to "turbine envy" among neighboring landowners where one landowner receives a financial benefit, another none, or very little, and all must live with the sight and sound of the wind turbines in their midst. Turbine envy, not surprisingly, has led to opposition to some wind projects by neighboring landowners who feel left out or cheated out of potential revenues. In my 1995 book Wind Energy Comes of Age I reported on interviews I'd made in the early 1990s where this phenomena was being increasingly noticed. "European developers have encountered an unexpected dilemma as a result of the large number of neighbors at each site. Down at the local pub in Cemaes Bay, for example, neighbors of EcoGen's Ryd y Groes project grumble: "Why couldn't they have put them on my land?" The farmers say they could use the money. Under the current system, adjoining landowners must endure the impact without gaining any of the direct benefits. Winkra's Henning Holst faces the same problem in Germany. It is possible, he believes, to construct a royalty system on impact zones. 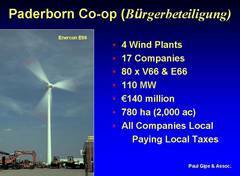 Those with turbines on their land would receive compensation as they do today. But turbine owners could also pay peripheral land owners more modest sums based on the parcel's distance from the project. Holst envisions compensation based on a series of concentric zones around the turbines. Those nearest the turbines would receive more than those further away." German developers never used this technique specifically, but they did devise means for compensation neighboring landowners. Typically they create pooling arrangements among neighboring landowners. In one example in the region of the German city of Paderborn, the developers combined all neighboring landowners in a land association or pool. 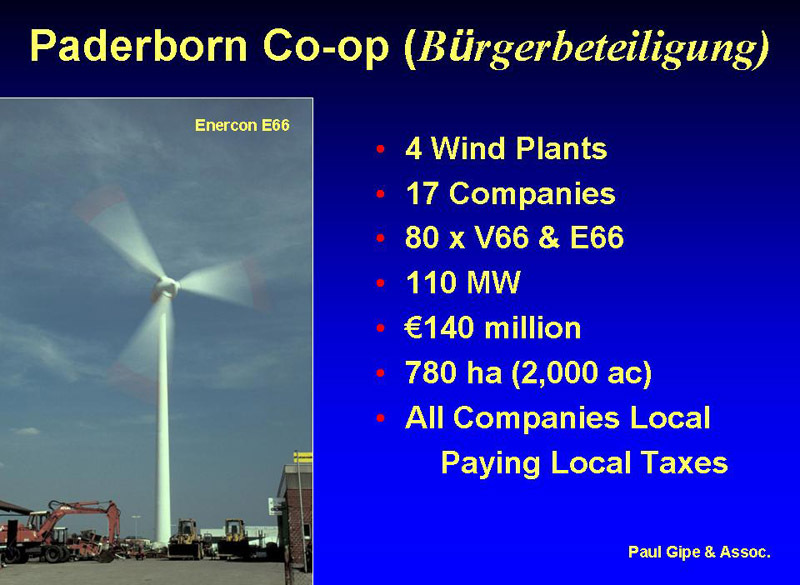 The land association then leased their combined land to several investor-owned cooperatives (Bürgerbeteiligung). Some wind developers in Canada have proposed similar arrangements where neighboring landowners receive a portion of the royalties as a percentage of their land in the pool. 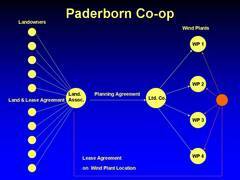 Landowners with wind turbines or other structures receive payments in addition to the land lease payment. At the 2005 CanWEA conference in Toronto, Prince Edward Island's Minister of Energy Jamie Ballem reported on a lease model they adapted from Germany. PEI is building a 30 MW wind plant on the eastern end of the island. Ballem has offered the landowners 2.5% of the gross revenue from the project. PEI is very windy. Ballem estimates the site for the 20 MW project has a wind speed of 9.5 m/s. Using Vestas V90s, Ballem estimates that each wind turbine will generate about $20,000 CAD per year. 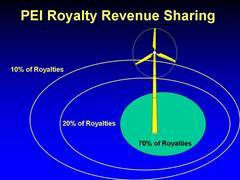 The royalties are divided into three zones. 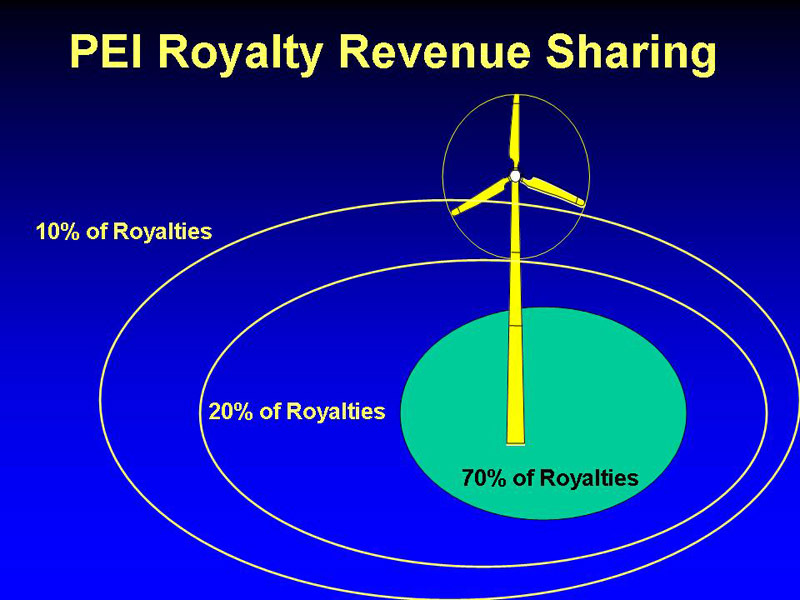 Landowners with turbines on their property will receive 70% of the royalties or $14,000 CAD/year. Those landowners within 100 m will receive 20% or $4,000 CAD/year. Those within 300 meters will receive 10% or $2,000 CAD/year. While in no way assuring that all landowners will be amenable to such an agreement or won't be resentful about some landowners receiving more payments than others, land pooling does increase the overall acceptance of renewable projects. Overall, pooling arrangements are more equitable to all landowners in an area than leases with only some of the area's landowners.